From the series Strangers by Jamie House. I have access to people’s memories, vacations and celebrations which I record in one single-image; a portrait of someone I do not know. The resulting images are layers of images and time within someone’s life. This project investigates how we disseminate and share images in the public domain and makes us consider issues of representation and privacy. 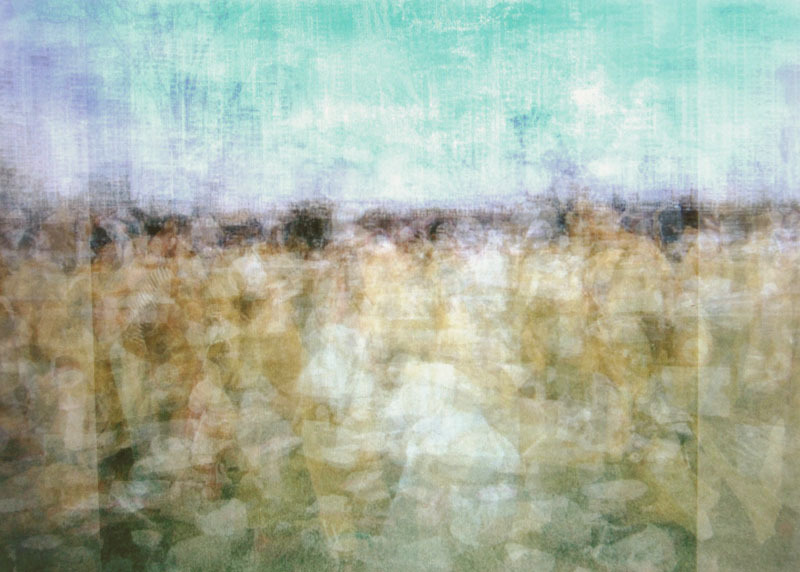 Jamie House works with social networking sites, taking people’s personal photographs and turning them into art. If you care to distinguish between the two. The images vary between being reminiscent of abstract paintings and sketchily detailed aspects of life. I am personally drawn to the former approach; the distinguishing parts of someones life merging and fading into obscurity somehow summarises the online world for me. I asked Jamie to make me a personal montage (see below) and was amused by the results. I was searching through the condensed mini-archive trying to locate parts of myself, my history and the key moments I deemed important enough to share with the online world yet found hard to make sense of here. Unfortunately I was disappointingly detailed, I clearly need to add more images to my albums to blend me into abstraction and help make better art. Nevertheless, Strangers raises timely questions whist also making visually interesting work, which is one definition of art, for those who need one. Jamie is a practicing photographic artist and has been involved in photography education for the past 8 years. His work has been seen in the Aperture project What matters now?, Brighton Photofringe and Hotshoe Gallery as well as being part of international art fairs and solo shows. He is currently the artist-in-residence at Karst, a contemporary arts space in Plymouth. SB: What captures you about photography? JH: It`s a medium that is constantly evolving and changing, photography being a product of technology since its inception with Talbot and Daguerre at the forefront constantly experimenting with this medium. Fast forward to 2012 and photography is a very different animal and still very much a product of technology and our time. I am very interested in the way technology, digital imaging and the digitization of photography has fundamentally changed our visual culture, and changed the way we think about what a photo is. The digitalization of the medium has changed how we store, view and access images online. The idea of the “networked Image” an image being an algorithmic piece of data that can have its own life online fascinates me, and how the “average” young person views hundreds of images a day also changes the way we “read” and process images in a non linear way. However aside from the digital image, I still take great pleasure in submerging myself under the red safe light in the darkroom and experiencing the latent image appear in the developer in front of my eyes. The alchemical process of developing a black and white image still excites me after 13 years of being a practising artist. -Leonard Kleinrock for creating the initial idea of the internet after he published his first paper entitled “Information Flow in Large Communication Nets”. -J.C.R. Licklider for sharing his vision of a galactic network. -Robert Taylor for helping to create the idea of the network. -Mark Zuckerberg for creating Facebook. -Artists Micheal Wolf and Jon Rafman for questioning the very nature of photography and experimenting with Google street view, capturing the sublime beauty and absurdity of everyday life and highlighting questions surrounding the surveillance of public spaces. -John Balderssari for using photography as a art form especially his early photography series “Wrong”. In this early and important example of conceptual art (with humour!) , Baldessari puts himself in the role of the amateur photographer. An unwritten rule known to every amateur photographer is not to photograph a person standing in front of a tree, especially not a tree that appears to be growing out of the subject’s head. For this work Baldessari had himself photographed in front of a palm so that it would appear that the tree were growing out of his head, this and other work really challenged the canons of photography in the sixties. Can you talk us through the technical process of ‘Strangers’? I have for the last several years’ stolen images of other people’s memories that I have mined from the internet on various social media sites (mainly Facebook). These people have befriended me online but are not people I have met in person. Each image is produced by a long exposure focused on a computer screen while browsing a stranger’s social media images. The resulting images are layers of images and time within someone’s life. Some images are more painterly and abstract; others are more figurative showing images of people with clearly defined profiles. 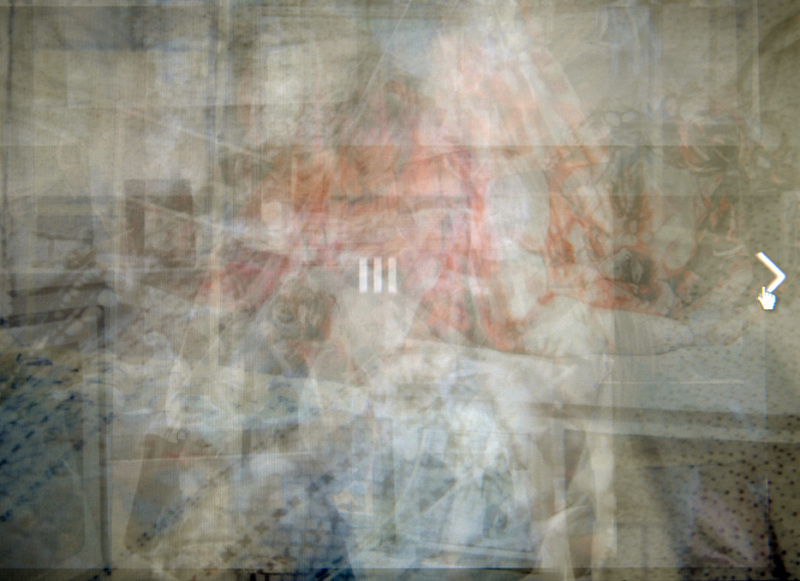 The final aesthetic of the image is controlled by how many images the person has in their Facebook album, if they have one hundred images the final work is abstracted if they have ten images details of the person, their friends and personal possessions are recorded in more defined detail. I use my skills as a photographer to frame and compose the computer screen and isolate details. For me these images and the process I use creates a new visual language if I zoom into the screen a grid of colour and the structure of the screen pixels become apparent. The individual size of peoples images within people browsers, the arrows that advance Facebook images, even the mouse cursor can and do become part of the work, these indicators of how the users navigates images are very interesting to me and hopefully make people question how we process and interpret images differently with the advent of digital images. I am naturally quite a nosey and inquisitive person, and this was a way I could vicariously live through other people lives through images they took and get under the skin of what it’s like to be alive today. I began to realise by using Facebook, that I have this vast archive of images from friends I know only virtually from across the globe, a giant melting of cultures and backgrounds. I am very interested by the meaning and interpretations of images I don’t know the answers to, I enjoy trying to imagine the intentions of the stranger’s gaze who originally took the images I am re-photographing. The photographs on somebody’s Facebook photo albums are usually really poignant in terms of the absence of the photographer taking the image, and how people’s subconscious vision informs what they are taking pictures of. However unlike a traditional analogue family album which was usually taken by one main family member, a Facebook picture album with the technology of geotagging enables multiples photographers to share their images of that person in one album so you have this very diverse and multi faceted view of someone you don’t know. How do you feel about using other people’s images to create your own, albeit very different, image? Has anyone ever questioned it in terms of copyright? I am totally comfortable in using other people’s images especially on social media platforms such as Facebook where they have signed up to share. People share their most private and intimate details with people they don’t know. In our current age of the “celebrity” we have a voracious appetite for ways to share what we are doing through you tube to the remains of reality TV, people have an increased desire to observe human beings at play. I personally think our rights to privacy are almost entirely non-existent, we live in a world where our every action is almost totally transparent to all. When I complete my images I usually repost these back on Facebook and it’s very rare that anyone recognises their own images. I see myself at times adopting the role of the curator, re-organising other peoples images that are representations of their lives, re-photographing and re-contextualising them. My long exposure technique seems to flatten all these layers of time into one single image. Do you know if the images, although often abstract, give any sense of the subject’s personhood (or at least how they are portrayed online)? E.g., chaotic, bright and vibrant, calm, serene etc? This is a very interesting question and a hard one to answer. I am not sure if the images I produce respond to emotions like chaotic or serene, however maybe the amount of images people have respond to how they define themselves by how they are seen by others, validating their actions and sense of self to the world. As a photography educator – do you think art can be taught or is it a natural way of seeing and interpreting the world? I am not sure if art can be taught or not, some people have a natural intuitive approach to image making where they almost immediately understand how to sequence images, colour relationships, metaphor and formal considerations of line, tone and perspective. I believe we are all born creative and as children undertake a lot of creative play and as we “progress” through the schooling system become more institutionalized to think and act in certain ways. I think one thing that can be taught is how to think critically and the ability for one to contextualise and position their work in contemporary practice and acknowledge the role of photographic and art history in one’s own practice. In addition to this I believe artists should and can be taught how to be “visible” and follow etiquette for contacting people in the art world. Finally I think an important thing that can be taught is how to promote yourself, be organised, have systems and have a good sense of business acumen. His work is curators choice at Photofringe. He is currently chapter 11 of The Digital Chain.